He always had a different look, sometimes a scraggly beard, sometimes a clean shaven face, sometimes a sleek mustache, sometimes stubble but he could never hide his grumbling, growl of a voice. Born Thomas Morgan Woodward on September 16, 1925 in Fort Worth, Texas, he dabbled in acting as a child and in high school. In college (Arlington State College and University of Texas) he majored in music and theatre aspiring to a career in opera. A serious sinus condition ended that dream and he found himself in the business world working for a steel company. Years later his good Texas friend, Fess Parker, mentioned him to Disney Studios for a part. Thus began a long and prolific career as a character actor. Because of his rugged looks and smoky voice he excelled at western roles, villainous or otherwise. Among his film credits were: "The Great Locomotive Chase" (1956) as Alex, his film debut; "Westward Ho the Wagons!" 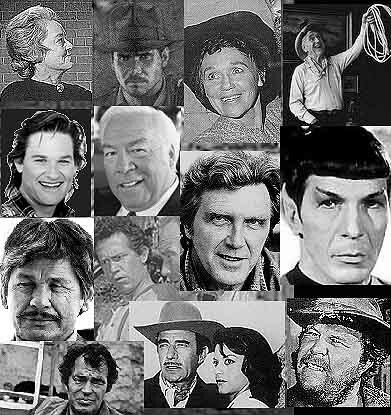 (1956) as Obie Foster; "The Sword of Ali Baba" (1965) as Captain of the Guard; "Cool Hand Luke" (1967) as Boss Godfrey; "Firecreek" (1968) as Willard; "Death of a Gunfighter" (1969) as Ivan Stanek; "Running Wild" (1973) as Crug Crider; "The Midnight Man" (1974) as Clayborne; "Final Chapter--Walking Tall" (1977) as The Boss; "Speedtrap" (1977) as Capt. Hogan; "Which Way is Up?" (1977) as Mr. Mann and "Ride in a Pink Car" (1978) as Jeff Richman. On TV he was a regular on "The Life and Legend of Wyatt Earp" (1958-61) with Hugh O'Brian as Shotgun Gibbs; "How the West Was Won" (1978) as Henry Coe; "Dallas" (1980) as Punk Anderson; "Days of Our Lives" (1987) as Phillip Colville and he appeared in the mini-series: "Centennial" (1978) as Gen. Wade. He guest starred on hundreds of TV series including: "Gunsmoke" (more guest roles than any other actor); "Bonanza"; "Star Trek"; "Wagon Train" and "The Big Valley." He was also the recipient of many Western Awards including the Golden Boot and the Golden Lariat.